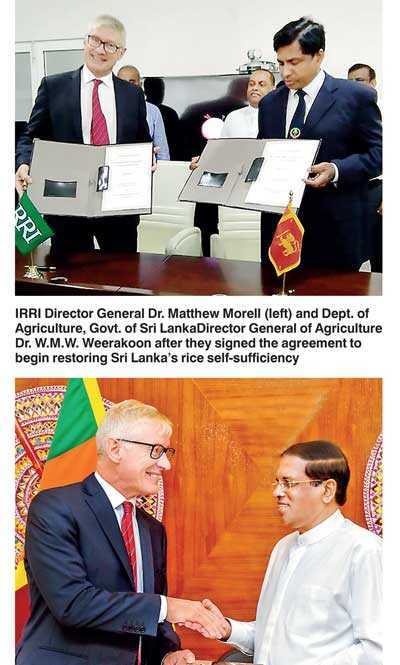 The Sri Lankan Ministry of Agriculture and the International Rice Research Institute (IRRI) have recently signed an agreement to begin restoring the country’s rice self-sufficiency. The agreement, signed by Dr. W.M.W. Weerakoon, Director General of Agriculture, Department of Agriculture, on behalf of Minister of Agriculture Mahinda Amaraweera and by Dr. Matthew Morell, Director General for International Rice Research Institute (IRRI); identifies priority areas for Sri Lanka’s agriculture and outlines broad areas for collaboration. This will, in turn, guide the planning and implementation of strategic initiatives in the country to re-invigorate Sri Lanka’s rice sector and support the government in achieving their key goal of self-sufficiency in rice. “Sri Lanka’s drive to restore rice self-sufficiency aligns with our goal in ensuring food and nutrition security in the region,” said Dr. Morell. “The Heads of Agreement that has been formalised now will help the Institute coordinate its efforts in supporting the Government of Sri Lanka as it strengthens the resilience of its rice and rice-based agri-food systems against climate change,” he added. Rice is the staple food in Sri Lanka and, until recently, the country had achieved self-sufficiency in rice production. In 2017, Sri Lanka was forced to import 700,000 tons of rice as the country experienced untimely flooding and its worst drought after 37 years. These recent challenges highlight the requirement for innovative solutions and partnerships to maintain Sri Lanka’s rice self-sufficiency.“That we had to import additional thousands of tons of rice in 2017 due to extreme climatic conditions reminded us of the urgent need to identify key areas we should act upon to ensure that we are better prepared in the event that catastrophes strike the country again,” explained Dr. Weerakoon. Spanning over 50 years, IRRI and Sri Lanka’s partnership has contributed to the country’s rice self-sufficiency. Supported by IRRI’s research, Sri Lanka currently cultivates 95% of the land that is available for rice cultivation with rice varieties that produce stable yields, require fewer inputs, and are climate resilient. IRRI is also able to help the conservation of genetic diversity of Sri Lanka’s rice varieties through IRRI’s rice gene bank. From over 129,000 rice varieties currently in the IRRI Genebank, 2,027 varieties are native to Sri Lanka. IRRI has further supported Sri Lanka’s national agricultural goals of furthering scientific training and knowledge exchange, by hosting 15 scholars at IRRI Headquarters in Los Banos, Philippines for master’s degrees, 5 for PhDs and about 100 participants for short courses in periods ranging from 2 weeks to 4 months on various areas of rice research and development. In recent years, however, rice production in the country has been constantly challenged by the increasing impacts of climate change; stagnation in yield growth; high costs of production, particularly labour costs; low private sector investment/engagement in rice-based agri-food systems; and weakening national rice research capacity. The partnership is keen to prioritise opportunities in: improving the exchange of rice varieties and germplasm; developing hybrid rice; ensuring efficiency in rice-based agri-food systems, water use, mechanisation, and climate change resilient rice production systems; as well as strengthening national agriculture leadership capacity. 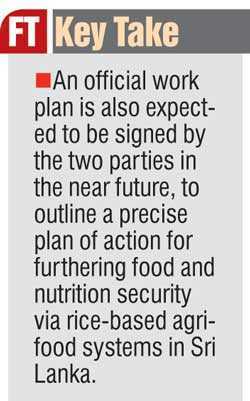 An official work plan is also expected to be signed by the two parties in the near future, to outline a precise plan of action for furthering food and nutrition security via rice-based agri-food systems in Sri Lanka.